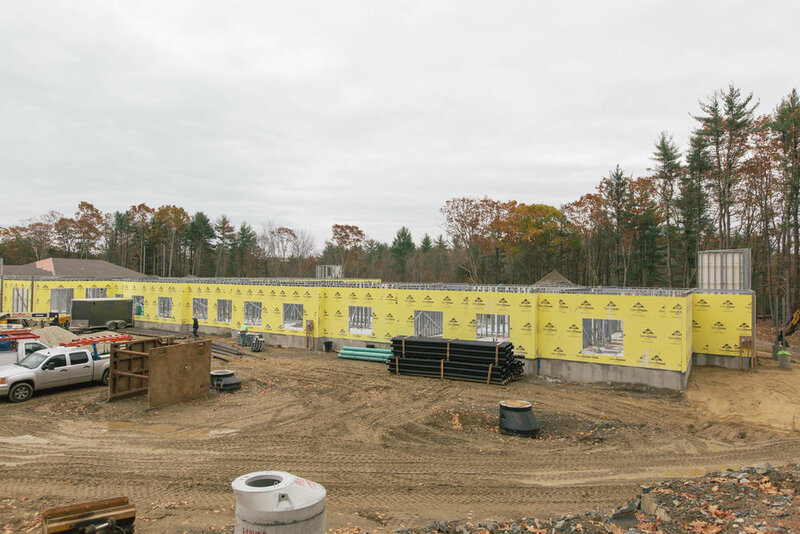 Construction on Hampton, NH’s newest senior community is underway! Cornerstone at Hampton Assisted Living & Compass Memory Support Neighborhood will offer local seniors unique and innovation living options designed to help them age in place. Cornerstone’s service-enriched Assisted Living neighborhood will feature EnrichedLIFE experiences and adventures, designed to encourage life-long learning and discovery. Cornerstone at Hampton will also feature a state-of-the-art, secure Compass Memory Support Neighborhood® affiliated with the Boston University Alzheimer’s Disease Center, and specifically designed to enhance residents’ independence, comfort and opportunities for socialization. Atlantic Prefab is proud to provide 2 stories of load bearing exterior and interior wall panels as well as the full metal truss roof system.